; a hostile encounter; an assembly for religious worship, especially of Quakers. Meetings. Do they happen in all work places or are they just a huge part of the mystery of how schools work? I have sat in so many over 30 years and I have even contributed to some, yawned in many, played EduAcronym ( hey and won!) and led some. I can recall teaching many great lessons and frankly a few poor ones but can I remember any meetings…not really. Does it matter? I think it might. Staff meetings, dept meetings, pastoral meetings, SLT meetings, governor meetings, Ofsted prep meetings, Ofsted feedback meetings. All those initiatives I have long forgotten TVEI, Diplomas,GNVQ Exam Board in fact just writing this I wonder how much time was spent there…….oh its exhausting just thinking of my life and energy ebbing away. I recall an “Excellence in Cities” meeting locally with every school given an extra INSET day whilst the project was launched with “At least you don’t have to teach today”. Just how uninspiring was that to be? No wonder that died a deserved death. After all I am a teacher and I love teaching, school might be different when empty but it’s not what the job is truly about. Do we have too many? and What quality and impact do they have? 1) Perhaps we can all get rid of as many meetings as possible. It is 2014 and we don’t need to meet as much as we used to in 2004 or 1994 because information can be accessed so many other way and it is! There is email, learning platforms ( meeting platforms), conversation and of course bits of paper. In fact if we are not careful we tell each other the same information in every conceivable way via notices, email, platforms and of course the message in a pigeon hole and then in case people might miss we tell them too. Actually we do this because some colleagues don’t seem to listen or hear or follow the plot. But I am yet to be conviced a plethora of meeetings gets the message through as these people often don’t listen to any forum. In fact, maybe, there is a lot of meeting noise in their lives. We need some meetings, we have profession duties to do so, we share about children, we share what works in our subject. WE have training, its a vital lifeblood : child protection, sims, first aid etc But do we need a meeting about assessment or appraisal or levels or no levels? Did a committee design a camel? Can we find better ways? Evolve stuff, not just bringing in more stuff. Get someone good to design say assessment, talk with other colleagues, maybe pupils, maybe governors and then test those ideas with respected staff, talk informally to people, pilot with a well chosen group, not just the keen staff but representative of all of our views. It’s harder work, has a greater impact but avoids wasting precious time. 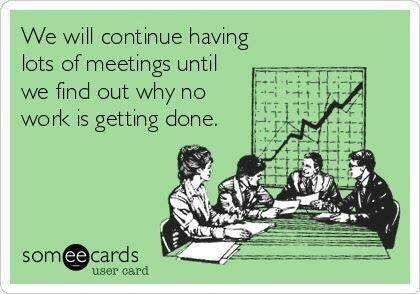 Staff meetings- why? Once per term, 15 mins a week? Check your meetings schedules and ask why? Middle leader meetings, senior leader meetings, are they training sessions and sharing sessions, do people come along vaguely excited or watching their clock ready to leave? How much work goes into agendas and minutes or action points compared to some serious thinking about purpose and impact. Let’s look for a clear reason to meet, and tackle that wholeheartedly. Choose the topic, lets have some of the research on the topic, maybe even read up beforehand. Some briefing from those in the know, those with some wisdom and then a hearty discussion. Pertinent questions asked or raised and some solutions or suggestions created. Some simple actions which we can all trial or pilot and come back and report on – or just blog about or just post a summary on the learning platform. It’s then somewhere we can find it to go back to when we have time or need or both. Much of the recent twitter noise on research ed just shows we are good with endless ideas of what might, should, or ought to work but we just struggle with feedback, lets work that feedback into our school structure if it is important. In fact we might start with some feedback about our meeting’s effectiveness. My favourite meetings aren’t even on the calendar [which I spend so long planning for at our school] they happen spontaneously, often with unlikely combinations of colleagues. They focus on children, often certain individuals, they pick up on general themes but concern a given situation, they end up bringing clarity and thoughtfulness. They drop out of something which happened in a classroom and so bring an added interest. They help me see what sort of teacher, with what sort of philosophy other staff are and help me think what sort I am. They are conversations which usually lift , inspire and show much humour. They make me think. I love this time of the year (summer) when this happens a little more. I love overhearing those conversations, before school lunch or after school or in a free. I love zipping through the staffroom and observing these conversations, or hearing my science colleagues sort out “how to teach this better”. I know many a reader is thinking hey ho typical SLT with their light timetables and time to chat – sure agreed, the job is delivered by you ( well and me) in a classroom. We do need the occasional whinge, the job has many challenges not helped by the beloved SoS or Ofsted or Ofqual or the decision to go to progress 8 or ditch levels, that useless parent..hey this could be a long list….. but we are in the job because for better or worse we all #loveteaching. Establish a culture where these spontaneous chats happen more and more. Maybe I should ask Ofsted to “observe” meetings and grade them? Then count those vital golden nuggets of staff chat. Classroom teachers do not have a lot of time, there are endless blogs about work/life balance and stress. Can we aim to help with our meeting programme and not worsen that workload? Let’s not waste each other’s time in meetings with endless agenda points which depress but instead clear the decks and get something inspiring, uplifting, purposeful – hang it we are intelligent people. Science meetings could ditch the agenda and in 45 mins do three “classic’ inspiring demonstrations that others might use; English can share new ways to introduce Shakespeare to the weakest learners; Design can show off what pupils have done and look at how they can be pushed to be even better…..there are lots more ideas, I’ll call a meeting to tell you. Q1 What are the most effective meetings in your school and why? Q2 How might meetings help in the workload stakes and work life balance for the conscientious teacher? Q3 What ways can you find to encourage and capture those intimate uplifitng good humoured conversations? The ongoing context of meetings can play a big part in making them useful. If the school has clear, shared, inspiring goals then departments and individuals can seek to improve and motivate in the light of those goals. Meetings and training have ongoing purpose, rather than being fragments of our imagination. Think that’s a very good point well made, and a significant part of making meetings feel purposeful. Probably helps to realise any school is on some sort of journey, standing still not an option. Best meetings with interesting people, absolutely. And some colleague actually work better if left to their own devices and out of the pernicious influence of uninformed newly promoted SLT!